Some images provided courtesy of the Asian Art Museum, San Francisco. The Fulbright-Hays Seminars Abroad provide educators with the opportunity to develop curriculum for classroom use. that uses visual information to enhance the study of world history. Alexander the Great and his armies conquered an area that stretched from northern Greece through Asia Minor, into Egypt, across Central Asia, and as far as the Indus River. Greek culture, both political and artistic, spread across this vast region. 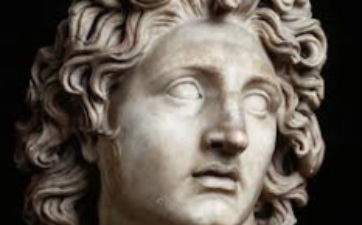 The three centuries following Alexander's death in 323 BCE were known as the "Hellenistic Age" and marked a cosmopolitan era of trade and interaction between cultures. Recent archaeological discoveries in Afghanistan and Pakistan reveal sculpture that is a remarkable hybrid of Greek, Persian, Bactrian, and Indian styles. In this unit, students will learn about the enduring cultural legacy of Alexander the Great across the ancient world's largest empire, recognize the characteristics of little-known Gandharan sculpture, and discover the artistic images from the "Hellenistic Far East." RH.6-8.9. Analyze the relationship between a primary & secondary source on same topic. 3. 3.2 View selected works of art from a culture and describe how they have changed or not changed in theme and content over a period of time. 3.3 Compare, in oral or written form, representative images or designs from at least t two selected cultures. Buddhist images. Students will recognize how Greek aesthetic ideals influenced the art of South Asia. • What examples of Greek art & architecture do we see around us today? • How does a culture acquire its ideals of beauty? • What causes "design" to spread from one culture to another? • Can you name any stylistic influences from other cultures that we've adopted? • How did Alexander's conquests influence the vast regions he conquered? • What do we mean by "Hellenistic art?" • What evidence remains of Greek art throughout Asia Minor, Central and South Asia? • What evidence of Greek art and architecture do we see in our community today?